A Good Eye for a Horse - De website van vsnhorses! 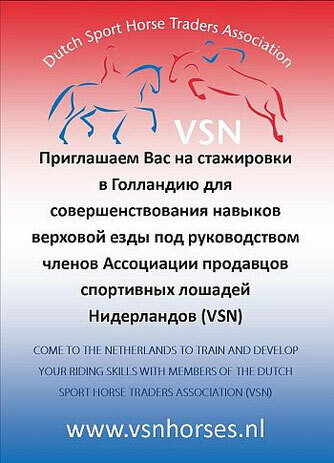 The Dutch Sport Horse Traders Association (VSN), founded in 1982, has over 60 selected members. They all are prominent, internationally oriented sport horse traders, specialized in the purchase, sale and training of sport horses at all levels and in every discipline. The VSN is the only organisation for Sport Horse Dealers in the World. They are all selected and respected and do not only sell horses, but also are very good in after sales. A contract of sale makes clear where buyer and seller stand. The VSN-members cooperate in order to serveit (inter)national clientele optimally, efficiently and reliably. As a result of their cooperation a high number of sport horses can be offered for sale, which increases clients' options. Many first-rate international sport horses did find their way to all parts of the world through VSN-members, varying from jumping horses, dressage horses, eventing horses to four-in-hand horses. VSN-members have the expertise and necessary contacts for all forms of transport to every country, and will take care of all accompanying export documents. VSN mediates in matters concerning sport horse trade and the autorities, such as the Ministry of Economic Affairs, the Veterinary Board and the Food and Consumer Product Safety Authority. VSN also cooperates with the equestrian breeding organisations and equestrian sport organisations and is one of the founders of the Federation of Dutch Equestrian Entrepeneurs (FNHO). Finally, every winter, VSN organises a competition for three-year-old dressage and jumping horses, the VSN Trophy. This Trophy has gained a permanent reputation amongst breeders, traders and other interested horse people as as good opportunity to display their young talented sport horses and to test their capacities.